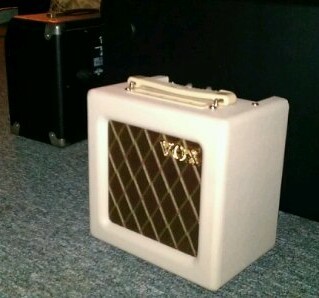 This is the new(ish) amp Schlock our main guit man uses in rehearsal. The Vox AC4TV Mini 4W Class A Tube Amplifier. It’s tiny. That other amp there is a Fender Frontman practice amp and behind the Vox is a guitar case. Yup, tiny but super noisy. Its max output is 4 watts of rich tubey goodness. But you can’t play it like that … gotta cut the wattage. Sounds great in a mic, and way easier than trying to get playroom volume level outta my 100w Sundown tuber. It’s an envy-inducing little box. Otherwise, laid down some noises tonight and we’ll call it generally productive. Later.